The other day there was a guy at a party talking about the bike he almost bought. He said he had the jacket all picked out, and described a few details of the leather. When asked what he was thinking of getting, he answered that he didn't know the company... that made the jacket. I see this more and more often. People are going for the look rather than the ride. They buy the gear and realize they don't need a bike at all. 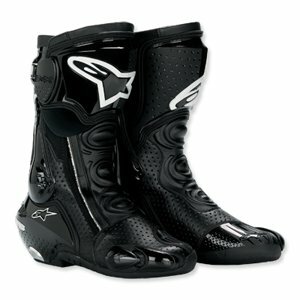 That's not going to happen with Alpinestars' S-MX Plus racing boots. They're not exactly cocktail party wear, which is more than I can say for several of Alpinestars jackets that I've seen turn up in martini bars. Racing boots through and through, the Plus are decked out with abrasion and impact protection panels all around, an injection molded shin plate, and replaceable aluminum heel sliders. Even the recessed buckles are designed to protect your calf from impact. The Plus has more braces and plates than I will take the time to mention. They go on with buckles, Kevlar laces, and a zipper. I worry about zippers because if they go, you've got to replace the boot rather than just a part -- but hopefully it's up to snuff. The Plus boots come in black, red, blue, or white. If the standard ventilation and breathable lining are not sufficient for your sweaty feet, you can get them with perforated venting. There are those who complain about these boots being squeaky and claim that a shot of chain wax between the shin guard and boot will fix the problem, but for the love of God don't get it on the sole before a ride. The armored TCX Competizione S boots are built for the racetrack as well.